Robot Operating System (ROS) is an open-source, meta-operating system for robot. It provides the services from an operating system including hardware abstraction, low-level device control, implementation of commonly-used functionality, message-passing between processes, and package management. It also provides the tools and libraries for obtaining, building, writing, and running code across multiple computers. ROS implements different styles of communication including synchronous Remote Procedure Call (RPC) style communication over services, asynchronous streaming of data over topics, and storage of data on a Parameter Server. TaraXL from e-con Systems is a UVC compliant 3D Stereo camera based on MT9V024 stereo sensor from ON Semiconductor which supports WVGA ((2*752) x 480) at 60 fps over USB 3.0 in uncompressed format. This stereo camera provides two synchronized sensor frame data interleaved side by side to the host machine over USB 3.0 interface. TaraXL can be used by customers who want to develop their Stereo camera algorithms and to integrate Stereo camera in their product design. It is provided with accelerated SDK for NVIDIA Jetson TX2 and Ubuntu 16.04 x64 which is ideal for depth application product designs. e-con Systems TaraXL Stereo camera is ideal for applications such as Depth Sensing, Disparity Map, Point Cloud, Machine vision, Drones, and so on. The taraxl-ros-package enables you to use the TaraXL Stereo camera with ROS. To download the taraxl-ros-package on github, go to https://github.com/econsystems/taraxl-ros-package. Before installing the taraxl-ros-package, you must install the prerequisites for TaraXL SDK. Go to http://wiki.ros.org/taraxl-ros-package to install the prerequisites for TaraXL SDK. After installing the taraxl-ros-package package, you can perform the features that are supported in TaraXL. To know more about the procedure to launch and perform the features of TaraXL, go to http://wiki.ros.org/taraxl-ros-package. Rectified Left Image – The image rectification is a transformation process to project images onto a common image plane. It is performed to remove distortion in the images and find matching points between images captured in left camera. Rectified Right Image – The image rectification is performed to find matching points between images captured in right camera. Disparity Image – The disparity image provides the distance between two corresponding points in the left and right image of a stereo pair. 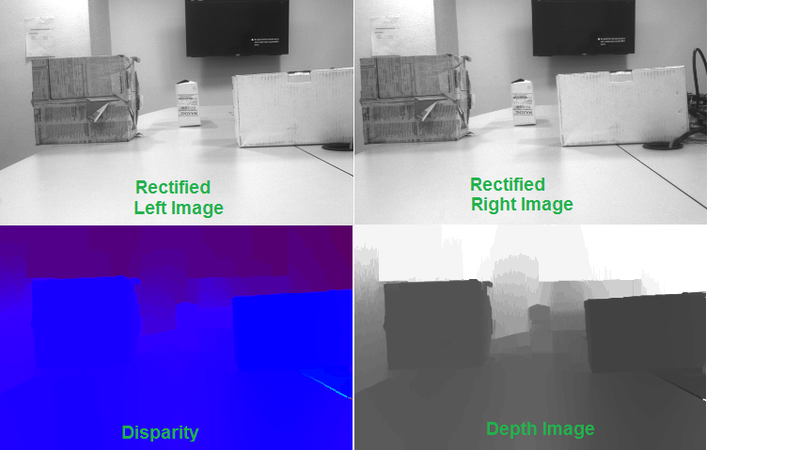 Depth Image – The depth image contains the information relating to the distance of the surfaces of scene objects from a viewpoint. Brightness – You can set the brightness value of the image from the range of 1 to 7. The default value for this control is 4. Auto Exposure – You can set the auto exposure for the camera by enabling this control. By default, this control is enabled. Manual Exposure – You can set the manual exposure value from the range of 10 to 1000000ms. The default value for this control is 8000ms. Accuracy – The disparity image will provide smoothness with minimal amount of noise. You can adjust the above settings by running the below command.